In a time when White Walkers traverse the Seven Kingdoms and no Lannister or Targaryen can truly be trusted, it's wise to brush up on the faces of those you should look out for. After all, a girl must be careful. 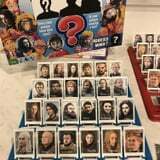 So, to help us stay sharp on our Game of Thrones knowledge, one Etsy shop has graced us with the gift of a Game of Thrones-themed edition of Guess Who?. While it isn't the only version of the game available, it's not difficult to appreciate the careful lamination of every handmade card and character icon that make this specific game a novelty item. Each card is also printed on thick card stock to prevent any transparency, so you really have to ask some good questions to find out which card your opponent holds on their side of Westeros. Does your character hail from the North? Have they ever met a dragon? Were they pushed through a window as a small child? Or did they meet their untimely end while sitting on a toilet? In case it isn't clear, Hasbro and HBO don't officially play any part in the production of this version of Guess Who?, but you can still have just as much fun as you did playing with the original as a kid - with a little more talk about murder and torture. So which character will you choose? Ser Ilyn Payne? Beric Dondarrion? Thoros of Myr? See all of the Guess Who? Game of Thrones faces ahead, and let's hope they aren't next on Arya's kill list.